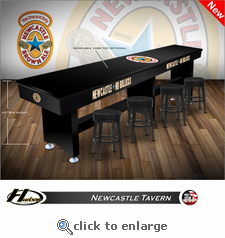 Introducing the Newcastle Tavern Shuffleboard only From Hudson Shuffleboards! Built for Commercial use for either a home or bar setting, the Newcastle Tavern Shuffleboard Table is raised to bar height and features an optional removable hard top that can be used during the day as a table and removed at night for shuffleboard play. This high quality game table features a 3” thick playing surface constructed of select kiln-dried Hard Rock Maple and topped with a Polymer Finish (lifetime warranty). This is the same finish insisted upon by the Professionals in tournament play. And to help keep the playing surface true, climatic adjusters are included. The cradle is constructed of solid wood with a black finish. The cradle and legs are constructed of solid wood. Sorry bar stools and Newcastle beer are not included. Join the Pros and enjoy playing shuffleboard on a newly designed Newcastle Tavern Shuffleboard by Hudson Shuffleboards. Available sizes are 9, 12', 14', 16', 18', 20', or 22' (tournament size). •One Set of Playing Weights with a Wooden Storage Case.